In a surprising display of narrative coherence, Charlotte introduces the blind singer and songwriter Sala Shane of ZHIEND fame. Too bad her appearance couldn’t be more contrived, as Yuu simply meets her strolling down the street and takes her out to lunch. Maybe I’m nitpicking, but surely there could have been a more meaningful way for these two to meet, especially considering this is the most progressive thing that has happened in the series so far. Gripes aside, it’s honestly refreshing to have a new character in the mix, and Sala plays the wise old blind character well enough, even pulling off the casual drunk trope too. 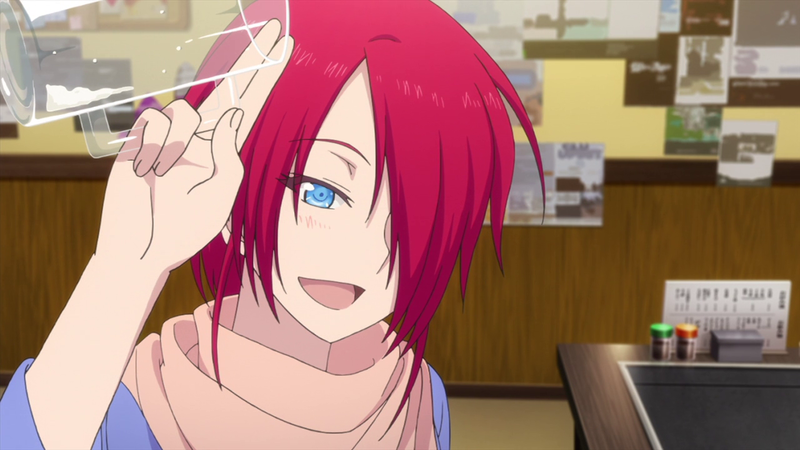 Those with have astute observations may recognize her seiyuu to be Miyuki Sawashiro, who also played the lead singer of Girls Dead Monster, Masami Iwasawa, from Angel Beats! 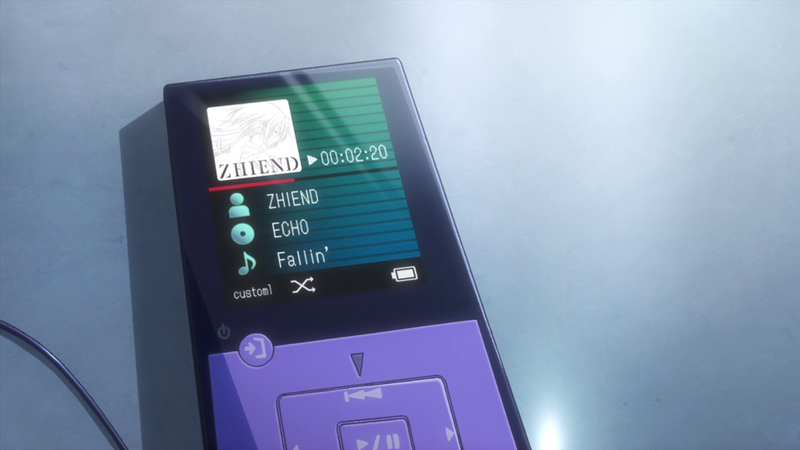 It’s definitely a deliberate callback since both works are created by Jun Maeda and both characters are rock band leaders with troubled pasts. While Masami’s past is incredibly tragic, Sala’s backstory is shrouded in mystery. She claims that she gave up her sight to God as punishment, and hopefully we’ll see this plot element return, as it no doubt will revolve around Yuu as well. As far as I’m concerned, there haven’t really been any bad ideas in Charlotte. They’ve just been poorly executed or explained. There have been interesting aspects like the incomplete superpowers and almost profound themes like being unsure of your place in the world. However, Charlotte has struggled to aptly string these elements together into a cohesive narrative. Rather than having a story where each part works together to tell something meaningful, it feels like a bunch of random ideas tossed together with the focus of each episode dedicated to the most uninteresting parts of the plot. There is the honest possibility that I’m simply watching this series with the wrong mindset, but at this point I don’t really know how to approach this series anymore. I hardly found their way of meeting contrived. 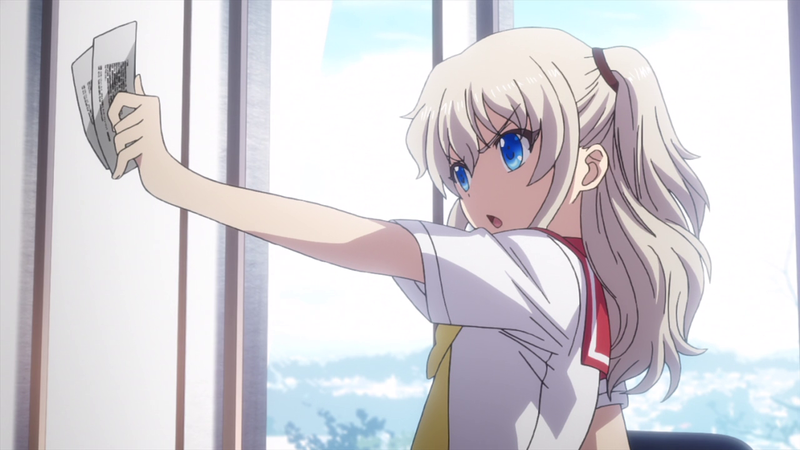 Neither character should have been looking for the other, and it’s Yuu’s use of this chance encounter, which the old him – before Ayumi’s death – would unlikely have taken the initiative with, that leads him both to develop Tomori’s and his own situation. The meaning is in the lack of ‘meaning’, in the fact that this event feels detached from the plot, and is yet brought into it by Yuu through his accommodation of her, an echo of Ayumi, and his emotional honesty, an echo of Tomori. I think the show’s doing a fine job of stringing it’s ideas together, but the one drawback I’ve always found with Maeda is that his ways of theme and character development aren’t for everyone, and sometimes the impressions his characters make won’t prompt some viewers to be interested in playing around with all the subtleties he juggles in each episode. There isn’t always automatic coherency, and that sometimes distances people from his writing when they’d get more of it by using its ‘issues’ as a challenge to dig deeper into what’s really going on. This is why I think Angel Beats! is so divisive, for example.